Home→Uncategorized→The Museum Tool Collection Grows. The bender is something I’ve been wanting to get for the tin shop for some time now. 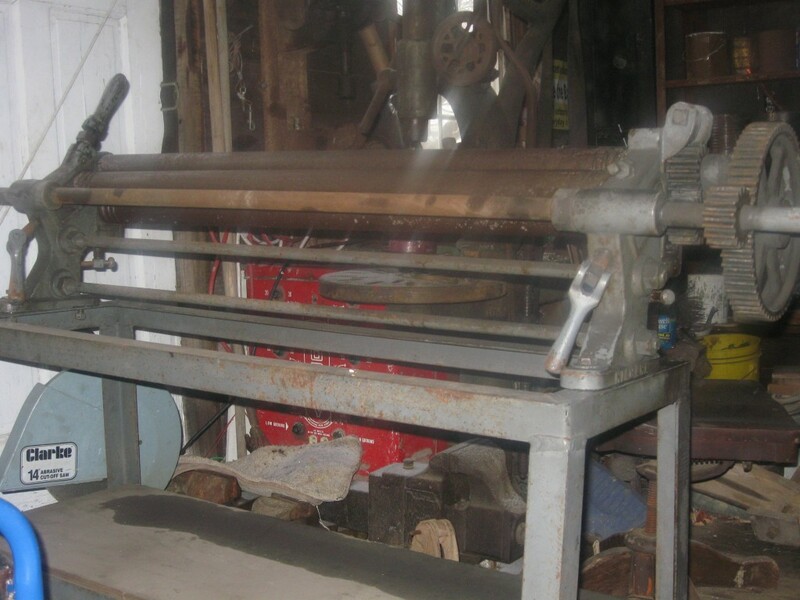 It’s used for bending or “rolling” flat metal for making tea pots, large or small pans, buckets and such. I actually found it online for sale at a fairly high cost. But once the gentleman learned of its use for the museum, he decided to donate it. A couple friends and I drove up to Cleveland to pick it up. It’s a good thing the 3 of us went. The bender was far larger than I had anticipated and it was all we could do to load it on Robert’s truck. We had to take it apart just to lift it. But despite its weight and size, it’s a great tool to have. The lathe is a real prize. Years ago I worked at Hale Homestead Farm & Village. Among the various jobs I held there was wood worker. There was a broken foot powered lathe in the shop, which I soon had working. 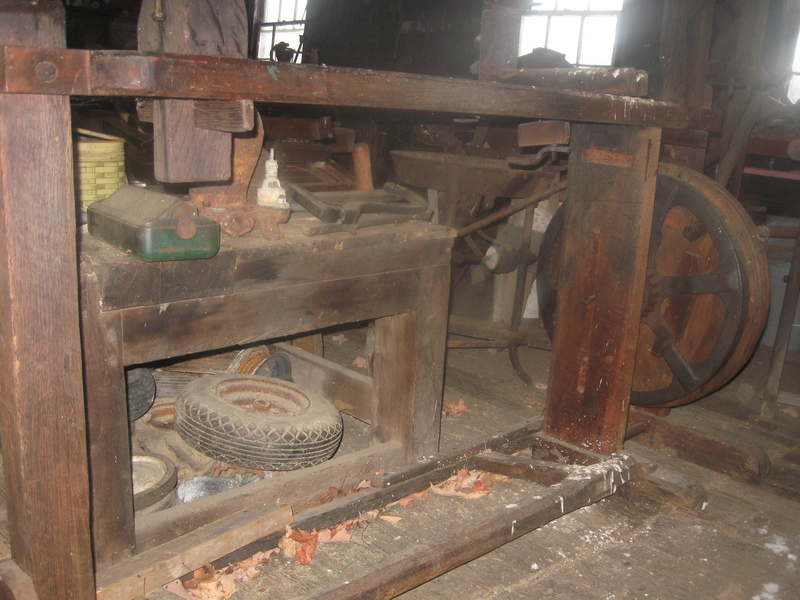 I have always wanted such a lathe to use here. I believe our “new” one may be a bit older than Hale’s. You stand at it and push the foot treadle up and down with your foot, which turns a large cast iron wheel, which spins a belt, which turns a pulley, that spins the wood, (that swallowed a cat, to catch the bird, that ate the spider, …). Then hold a chisel against the spinning wood to shape it down it into stair step spindles, Shaker style clothes hooks, candle sticks, lamp posts, wooden bowls or whatever else you need or imagine. When we went to pick up the lathe, the gentleman also had an exceptionally beautiful Victorian hanging lamp, which we hung in the main house kitchen. The bicycle grinding wheel was another donation. It’s really neat. You sit on a metal seat, much like a bicycle’s seat. Then you turn the foot powered pedals with your feet in order to turn the grind stone. It’s used for sharpening knives, chisels, garden tools like shovels and hoes, or smoothing metal edges before blacksmithing or welding. It’s a really nice tool for when you are working alone. Some of the older style grind stones had a hand crank on the side. You either had to hold the piece you were grinding with one hand while turning the crank with the other, or you needed a helper to turn the wheel. With the “bicycle” you can sit down, turn the stone with your feet and have both hands free for the work., without having to employ an apprentice. 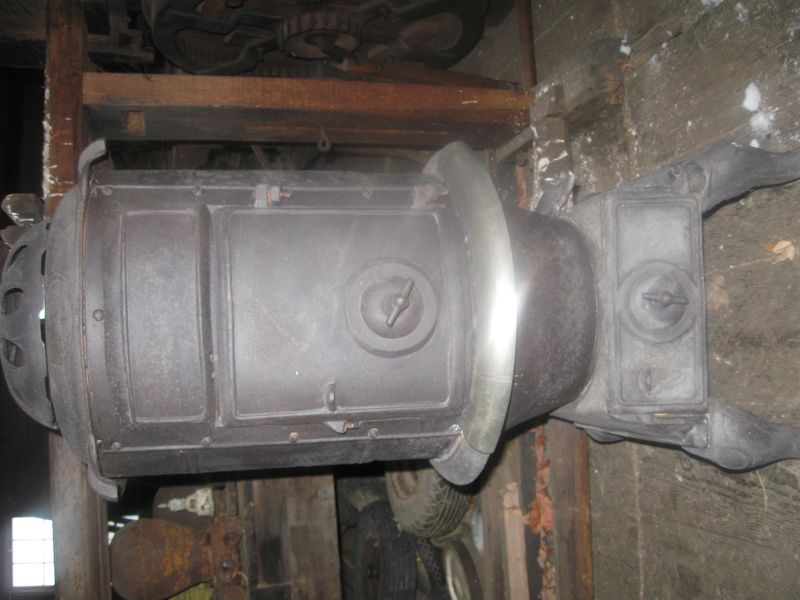 We recently received two wood stoves. The first one was donated by a family in Garrettsville. They had it out in the barn, which was quite a neat structure. They took me upstairs to show me the burned walls from a barn fire a hundred years ago. The fire burned the roof right off the building (the current owners had found an old newspaper article about the fire), while leaving the first floor untouched (-hooray for firemen). The stove will need a bit of work to make it safe to burn, but it has a great look as is. The second stove was also a donation. The Hinckley Historical Society called and asked if I could use it. They decided to close one of their houses and had too much furniture to incorporate into their other buildings. 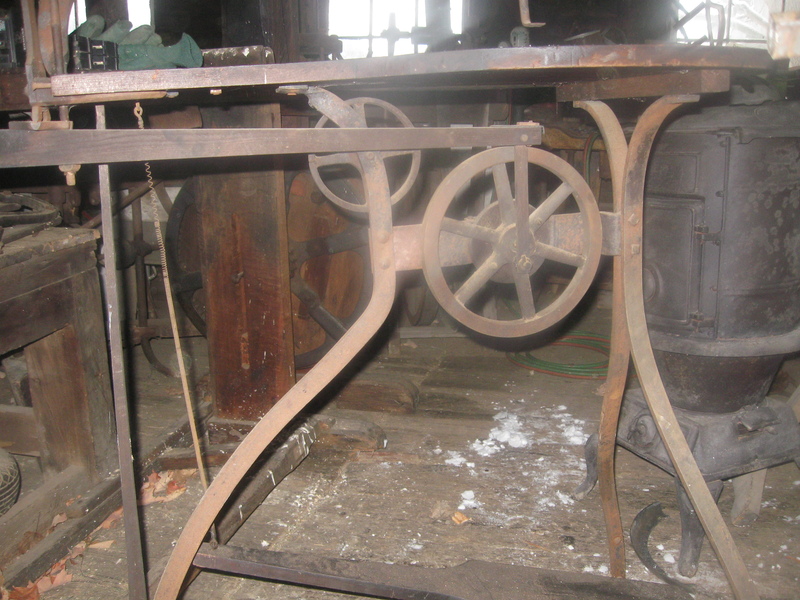 The stove is ready to use, has a great look, and will make a very nice addition to the Blaine-Stewart Cigar Factory. I’ve wanted to use the factory (the building was originally the Darrowville Post Office) during colder weather, and the stove will work just fine. The forge is a real prize. It’s all homemade. 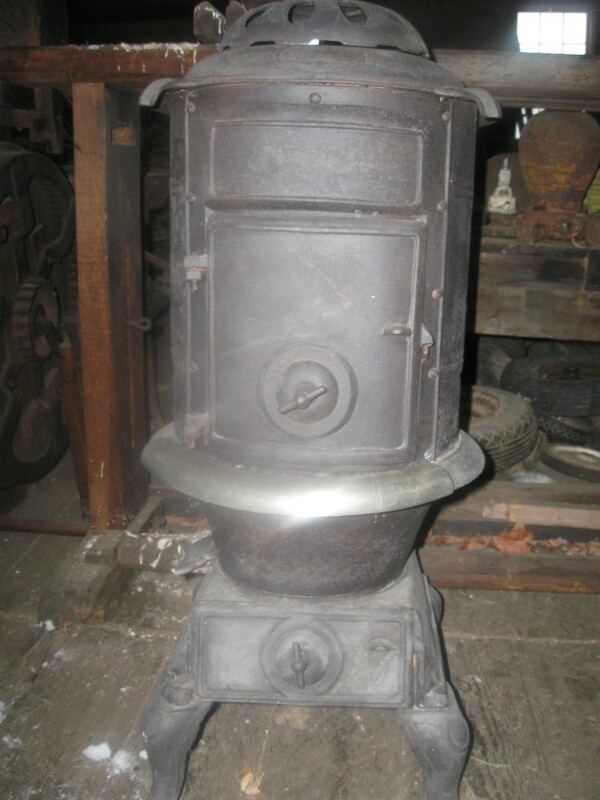 It has a wood frame which holds a cast iron base of an old wood stove. 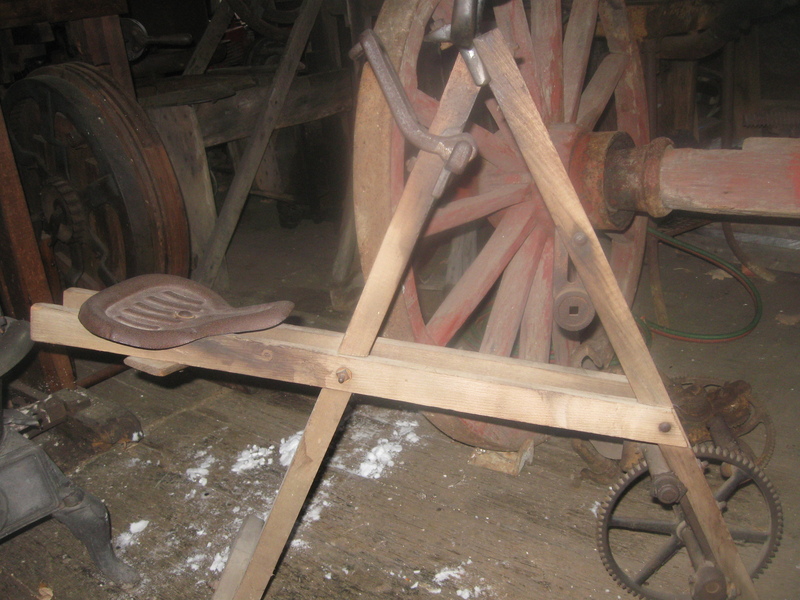 The maker of the forge used a wheel from a corn sheller, attached a pulley to it to turn a belt that turned a fan. The fan was connected to the bottom of the forge by part of a tractor manifold exhaust pipe and some bent tin. Bits and pieces put together to make a perfectly working forge. It looks to me to have been made in the 1930’s when there was little money for store bought. It’s just the kind of thing I really like to collect and preserve, -one of a kinds.